IT IS A HERITAGE FOR ALL CIVILISED PEOPLES. It was at this time that the future of Ypres was still under discussion; Winston Churchill put forward the idea of preserving it in its wartime state and foresting the old battlefields. The people of Belgium rightly wanted their land back and did not want to reside inside a museum so this never happened, but the rebuilding of the city was not complete until the 1960s. 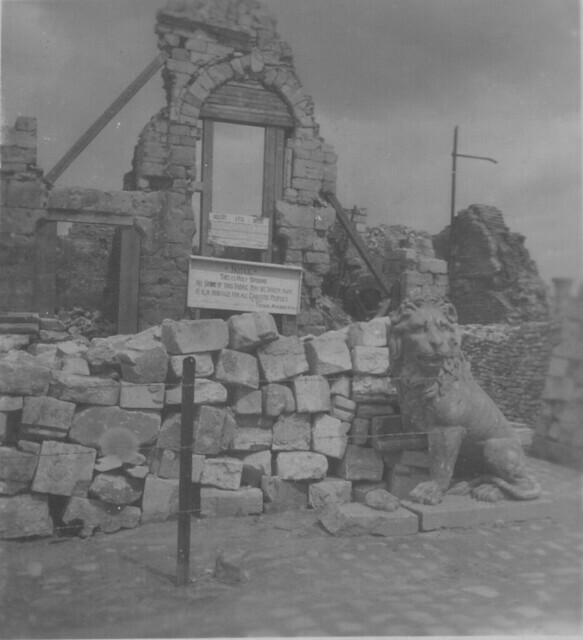 The Menin Gate Lion seen here was one of a pair that was eventually given to Australian in 1936 and now reside in the Australian War Memorial in Canberra. This entry was posted on 30/03/2012 by sommecourt. It was filed under Aftermath, Battlefields, Belgium, Flanders, Western Front, WW1, Ypres and was tagged with Aftermath, Battlefields, Flanders, Ypres.